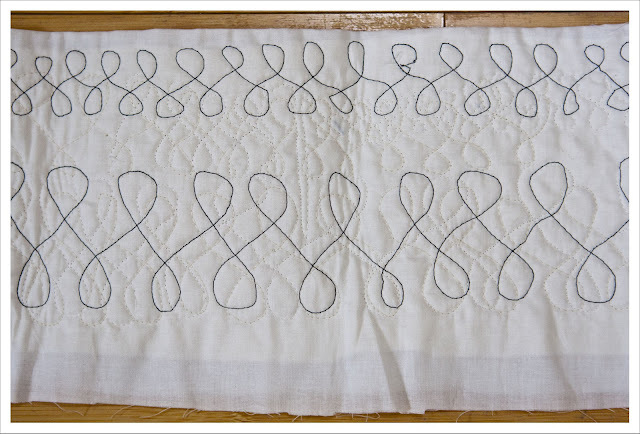 I don't do New Years resolutions but one of the things that has been bugging me last year is that I can't do FMQ. Now it is no secret that I prefer straight line or circular quilting and I think that will always be the case. It is also true that there are very few FMQ patterns that I like. A lot of them are to busy for me and seem without purpose. Don't get me wrong I do admire well quilted quilts that are densely quilted with multiple patterns but most of the ones I love are in fact long-arm quilted. Take the stunning Space dust quilt by Tula Tink that was quilted by Angela Walters. I guess if you were a really good FMQ quilter you could do this kind of detail on a normal machine but that would take much, much to long (for me anyway). But there is one FMQ pattern that I absolutely love and I am determined just for that single pattern to learn FMQ. 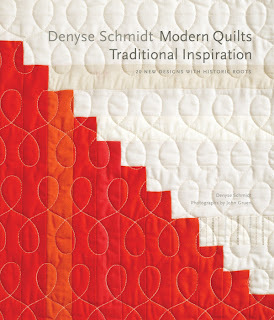 The pattern in question is the continuous eight which is very often used by the great Denyse Schmidt and can be seen in her books and in fact on the cover of her latest book. 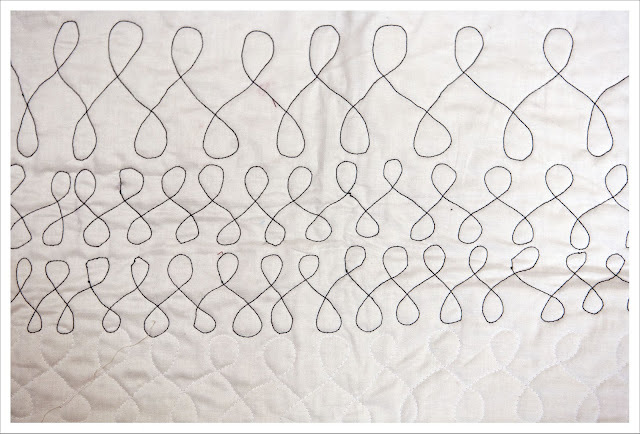 I love the simplicity of it and that it is an actual pattern rather than meandering lines. 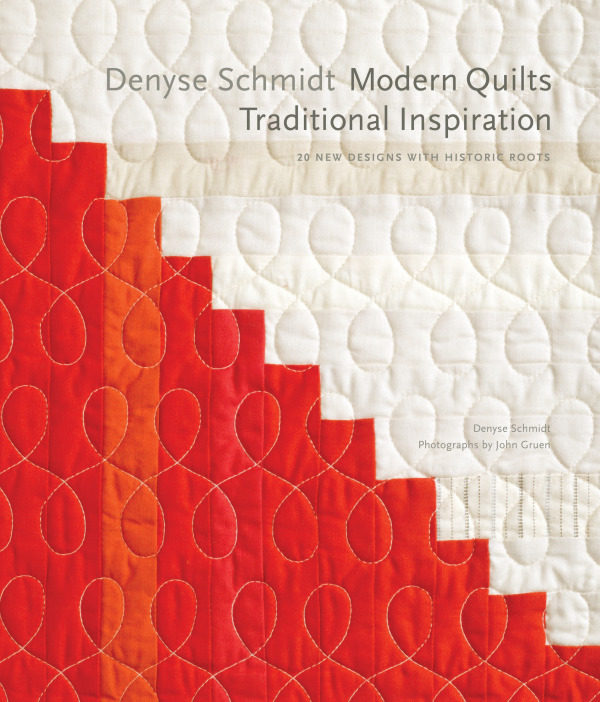 Although Denyse's quilts are mostly long-arm quilted I believe that this is a pattern that could be done fairly easily on a good home machine such as my Janome Horizon 7700. The machine has a very good FMQ foot after all. Another reason why I have not had a go at FMQ is that I always thought it to be VERY difficult. I have conveyed this often to the lovely Trudi and she responded on many occasions that it actually wasn't difficult at all. So when she told me the last which is already more than five month ago again, I resolved to have a go at it. So my plan is to improve over the cause of this year until I actually will be able to do the pattern on a sofa sized quilt. 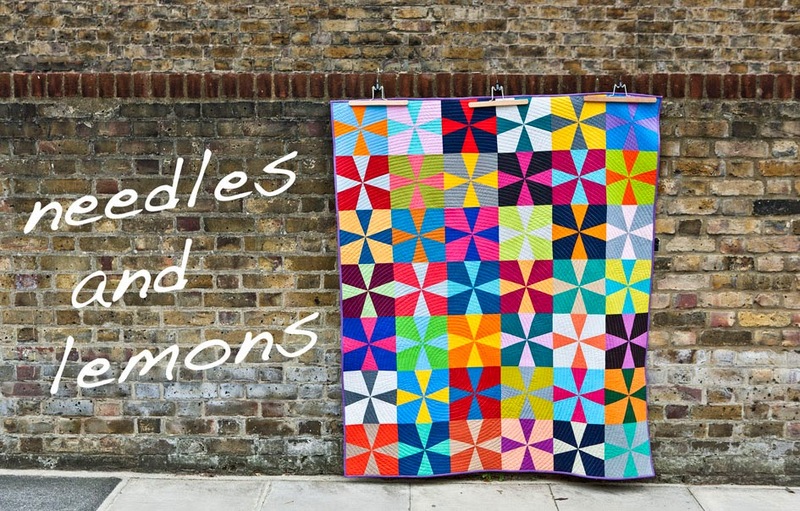 Tall order, I know but I do hope you support me in my endeavor and if you have any advice regarding FMQ or regarding this particular pattern then please let me know. This below is my very first attempt which was merely some meandering to get used to the fact that you actually have to move the fabric under the needle. I found this really odd at first. With my second attempt I went straight into the eight pattern; first with a white thread that I later changed to black when I realized this won't photograph to well. The eights are still very wonky and all over the place but I was happy that I managed to actually make continuous eighths in the first place ! My third try is yet another improvement. I first sewed with the white thread and then with black on top of this. The white thread is a Gueterman thread that is a little thicker than the black 50w Aurifil and therefore the eights with the white thread look actually better. The 50 w is to thin and the stitches seem to look like a continuous line rather than distinct stitches. Of course this could also be a problem of tension but for now I think I will work better with a 40w or 30 w thread. Whilst the eights are still wonky, I nonetheless was rather surprised and pleased that I actually managed to do them in a fairly straight line. At first I drew a 3 inch line but later on did it without the lines which worked just as well and in fact better. Has any of you done this eight pattern and if you have what is your experience ? They are great! It is good to the progression you have made in just one day! It is addictive once you have started. Just keep practicing! 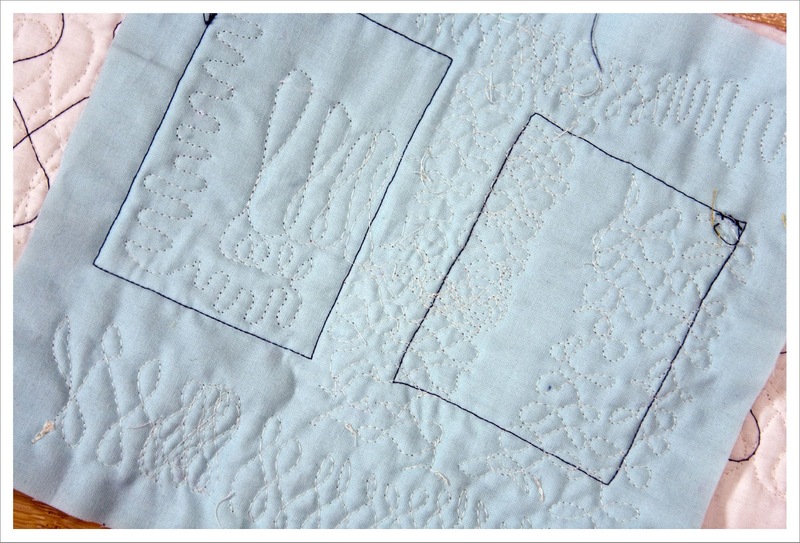 To be honest, I find FMQ easier now than straight line quilting. Its more forgiving of mistakes. I like using loopy designs like this, some people I think find loopy easier and others designs with angles like boxes and triangles. If they are not all completely even in size, once the quilt is finished and washed it isn't very noticable. What you see is the overall effect. I'm glad you gave it a go! In all honesty I still have a hard time with stitching in the ditch! Sew, any attempt at FMQ is honorable. You're doing great!! I have only done this in a small class that I took; and on the Dec. sample of the FMQ Challenge this past year. I do like it; but don't know enough to tell you much of anything except practice. That seems to be the secret to it all. Amazing stuff - don't be so hard on yourself. each time you get better and better. I have not tried it yet, but I sure want to. I see MAry @ Molly Flanders is doing this on her Courthouse Steps at the moment! Great to see you practising- you are 'getting your eye in' and training your brain! 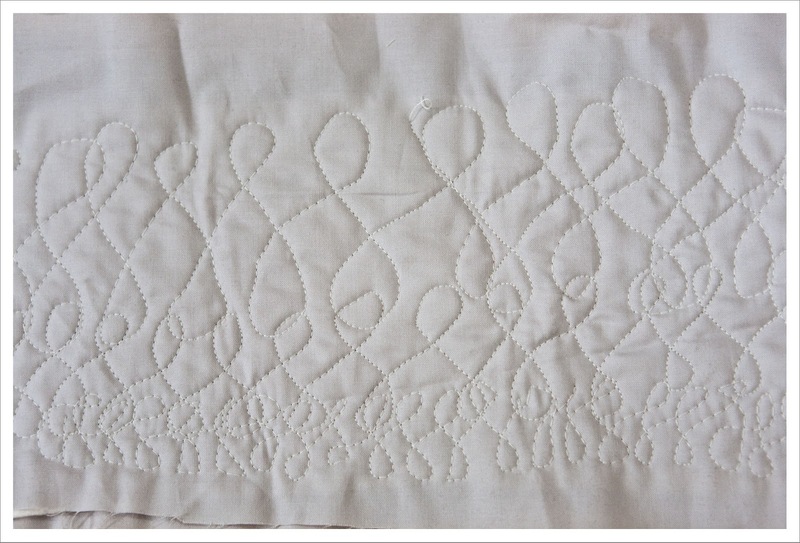 This is a lovely FMQ design - yours are looking great! Make sure you wear gloves and if you have not read Leah Day's tips for using the Horizon (don't drop the feed dogs, or change the tension, use a super slider, etc. ) Beyond that it is just practice. I would love to also be able to do nice figure 8s, you will get it in no time. this my first time on your blog. I, too, am hoping to improve my fmq skills this year. Glad to see someone else is has had the same results as me! I started this year but I'm still finding it really hard! It's like moving the paper under a pencil to write a word, which is so alien to me! Good luck and keep up the practice! Great start - just keep practising - little and often is better than lots in one go I found. Doodling also helped me...and being relaxed, enjoying it and having fun! I learned that when I quilt with this design, I always need to go across the quilt in the same direction so it is the same motion. I tried going back the other direction and kept on getting the design wrong and needing to unpick stitches. Now I always just travel left to right.